Product prices and availability are accurate as of 2019-04-21 23:22:30 EDT and are subject to change. Any price and availability information displayed on http://www.amazon.com/ at the time of purchase will apply to the purchase of this product. 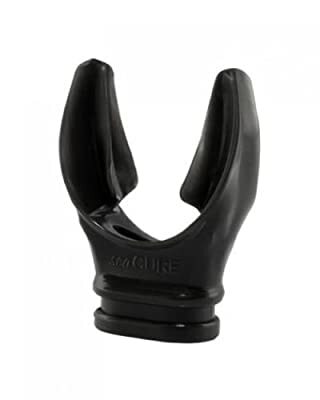 SeaCure is a unique, moldable mouthpiece designed to precisely fit the individual diver's mouth, teeth, gums and jaw configuration to provide maximum support of a regulator and, thus, eliminate jaw fatigue. The professional as well as the recreational diver will find SeaCure to be extremely well suited for all types of diving conditions. The newest model, the X TYPE, offers a totally new X shaped profile, which significantly reduces bulk, virtually eliminates gagging and improves molding by earlier engagement of the teeth during closure. The new X TYPE also includes an improved one piece molding and sealing attachment with a bite limiter which eliminates the possibility of over closure during the heat molding process. Over closure reduces air flow during diving. The attachment is used in the molding process and then to keep debris out of the regulator.